From the word Ethereum, the second popularly known crypto currency next to Bitcoin. This is an open-source, public, blockchain-based distributed computing platform and having a feature of scripting (smart contract). Many crypto investors love to hold and invest into Ethereum (ETH) due to its modified version of Nakamoto consensus via transaction-based state transitions. Those unimagined applications like electronic voting, regulatory compliance & trading, and digitally recorded property assets are now actively being developed and deployed faster because of the Ethereum blockchain technology. Like Bitcoin & Bitcoin Cash, Ethereum (ETH) can also be mined. ETH miners can earn Ether, a type of crypto token that fuels the network. It's also used to pay for transaction fees and services on the Ethereum network by the application developers. But there's also another type of token that is used to pay ETH miners fees for including transactions in their block, it is called GAS. For every smart contract operations requires a certain amount of GAS to be sent along with it to entice miners to put it in the blockchain. How to buy Ethereum (ETH) using Philippine peso? Now! 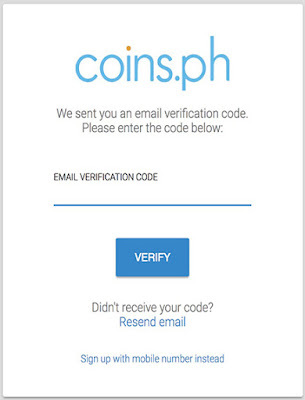 you should have an account first on Coins.ph if you really like to buy ETH using fiat currency in the Philippines. 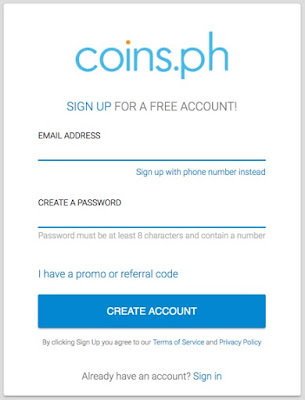 - Then click "Create An Account"
But before you can get Ethereum (ETH), you need to do 'Cash-In' to your coins.ph wallet account. There are many ways to do that, don't worry. Then if you've successfully put your fiat currency into your coins.ph wallet account. 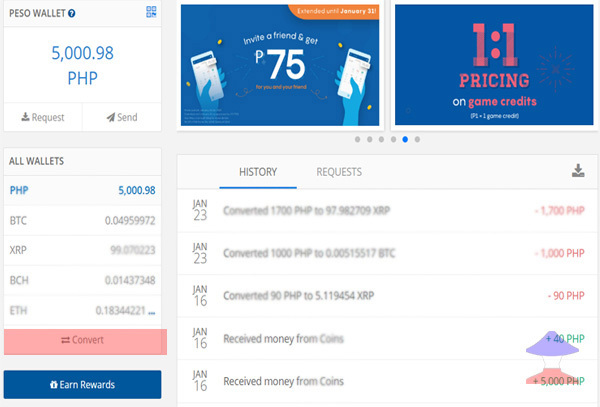 You need to select your PHP wallet and start converting your money (Philippine peso) into Ethereum (ETH). 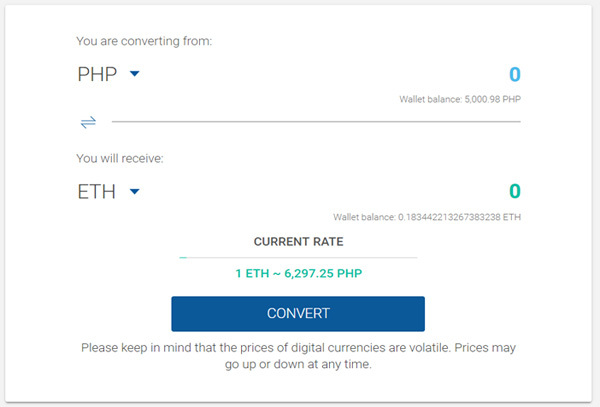 Go find the "Convert" button then press it to start, be sure that you're in the 'From "PHP" selection' and the Ethereum (ETH) is the coin to receive after the conversion. Many crypto experts believe that Ethereum is the best crypto currency to invest and hold while waiting for the higher price to come. Because many ERC20 tokens today are getting successful for their journey as fintech company. And due to that instance, many are hoping that Ethereum price will go up tremendously throughout the coming years. ERC20 tokens are made from smart contract on the Ethereum blockchain. ERC stands for Ethereum Request for Comment, and 20 is the number that was assigned to this request. The clear majority of tokens issued on the Ethereum blockchain are ERC-20 compliant, according to Wikipedia. Disclaimer: This is not a financial institution: All information provided here is for educational material: Do not take this information as professional investment advice. 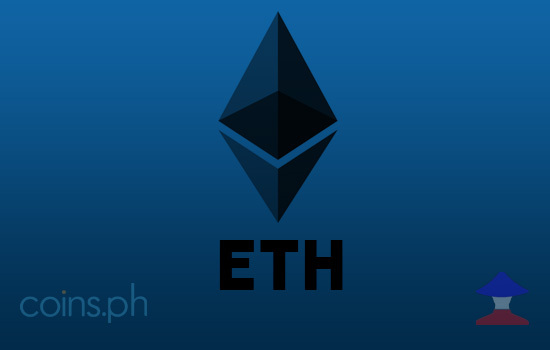 Comments or suggestions about "How to Buy Ethereum [ETH] using fiat currency in Philippines" is important to us, you may share it by using the comment box below.